From airlines trying to do something different to a police department wanting to gauge its usefulness in the streets, Google Glass is continually implemented in many useful ways, even if there have been several setbacks. Even so, you can add Beth Israel Deaconess Medical Center (BIDMC) to the list of useful Google Glass uses. On his blog, BIDMC chief information officer John Halamka revealed that his hospital ran a pilot program that used Glass for an in-house patient information system that was developed in the emergency department. Here’s how they used Glass: A QR code is placed outside an emergency department room, which a clinician can scan using Google Glass. After scanning, Glass shows the clinician everything there is to know about the patient in the room, such as vital signs, lab results, problems, and other data. This re-imagines the status quo up until now, which involves having to divert attention away from a patient in order to use a computer and read any related information. Integrated with the ED Dashboard, a system that hospitals use to monitor patient flow, the custom application uses Glass’ gesture support to interact with the user interface, its cameras to analyze QR codes, and perform various voice commands. The hospital made a few modifications to Glass, such as iPhone pairing, adding an external battery pack, enabling vertical scrolling by tilting your head, and other optimizations. Fortunately, though, BIDMC is not the only hospital in the nation that plans to change the way doctors care for their patients – we also have Rhode Island Hospital, which will use Glass in its emergency department. 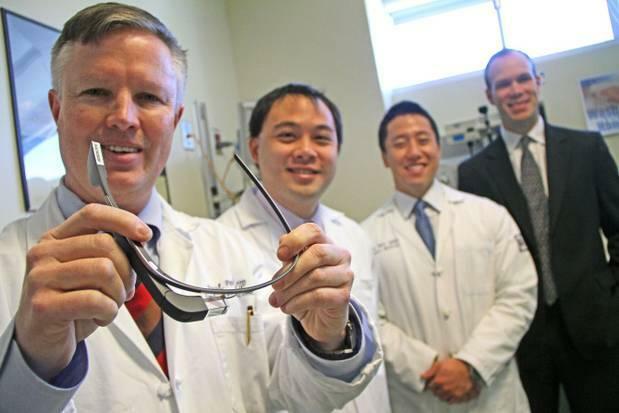 Both plan to offer their programs using Glass in the emergency room, though RIH will initially limit the program to emergency room patients afflicted with skin rashes or other dermatological problems and who are okay with a Glass-wearing doctor. Ultimately, both hospitals’ programs offer a large amount of potential in improving patient care while also increasing doctors’ efficiency. All of a sudden, having an ambulance crew equipped with Glass, which would let a clinician back at the hospital know exactly what to prep with to instantly provide patient care the moment they step in the hospital, is not that far-fetched of an idea. BIDMC will roll out the program, which was in beta up until now, in a matter of weeks, while RIH will most likely roll out its program after its ensuing six-month study is over.